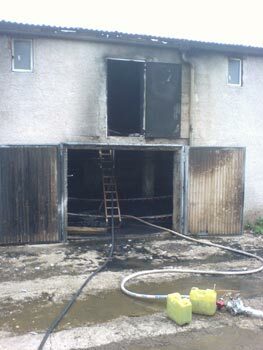 On 05/08/07 at 03:40 p m the fire departments of Nittenau, Bergham and Bodenstein were alarmed for a fire in a chicken farm in Trumling. Due to the visible extent of the fire the fire departments of Reichenbach and Neuhaus were called for support during approach. 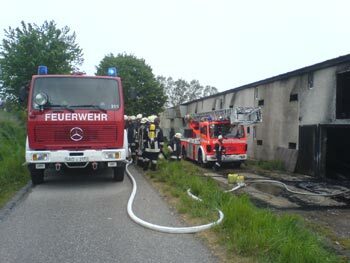 An about 150 m long and 15 m wide building had caught fire on the first floor. At about half of the length of the structure which was at the time empty because of construction work, there is a separating wall (not fire proof). 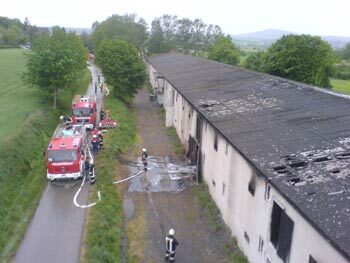 A massive interior attack from two sides was started, supported by the VFD Nittenau ladder from the outside. 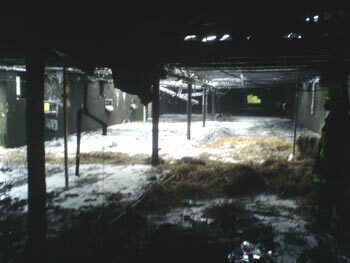 Near the structure there was a liquid gas tank with conduit to the inside which was immediately put out of action. At arrival time of the fire departments half of the first floor to the separating wall was completely on fire. 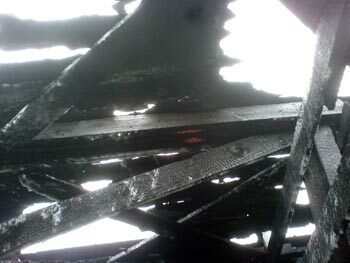 The roof cladding was combusted on several spots. Nevertheless, the fire could be stopped at the separating wall, so that only half of the first floor burnt out. The use of Class-A foam was helpful in particular. Cause of fire was probably a damaged power supply.